The great city of Kissimmee has been growing for the past century and continues to show promise in its economic expansion. With the area quickly becoming one of Central Florida’s larger cities the houses and vacation homes in the area are in abundance. However finding the one that suits you can be tedious and time consuming, lucky for you we know the area better than the residents themselves, and we can tell you everything you need to know about the Bella Vida Resort. 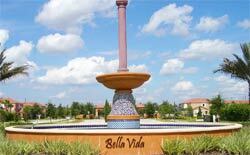 Bella Vida is located very near to the center of the city of Kissimmee. Not close enough that you have to deal with all the hustle and bustle, but just close enough that getting into town is just a short visit away. With stores like Wal-Mart, Home Depot and a variety of grocery stores all your necessities are within reach. If you’re looking for a vacation home in the area you probably already know that Kissimmee is just a very short drive away from Central Florida attractions. In fact the Bella Vida Resort is only five miles from the entrance to the Walt Disney World Resort, which is home to the Magic Kingdom, Hollywood Studios, Animal Kingdom, Epcot and two water parks! Just a short distance further you can find Universal Studios and Islands of Adventure, connected by the popular City Walk. If you’re looking for more adventure you could visit Central Florida’s Sea World or its neighboring theme park Discover Cove, both equally as entertaining and educational! Because Bella Vida is located so close to the Orlando area you can find many local attractions and entertainment in the area. One of the most notable is Old Town, located between Orlando and Kissimmee this fun little shopping center is filled with carnival rides and local stores selling unique merchandise. In fact the neighborhood is located right behind one of Kissimmee's premier dinner shows, the Medieval Times. Or you can visit Gatorland, even take an airboat ride on the popular lake Tohopekaliga. 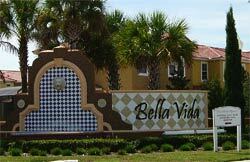 The beautiful neighborhood of Bella Vida will catch your eye instantly when you drive up to it. 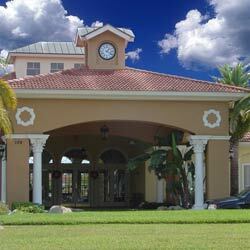 The colorful rooftops and large sign showcasing a fountain will quickly grasp your attention. The large gate with twenty four hour security you pass through is great reassurance for those living therein that their house and belongings are under constant watch. Pass by the large fountain on the main street before arriving at the large clubhouse. Behind the clubhouse you can find a large open field, a playground and a volleyball court. Inside is an exercise center, a dining area and a relaxation area. Of course no good club house is complete without a massive pool, and here at Bella Vida you get just that! The neighborhood houses a large lake in the center of the community. People that lived in the area before the community was built here will tell you that the pond is teaming with fish. With houses on the waters edge you could wake up every morning and throw your line off your back property and be fishing in relaxation. 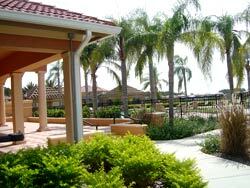 The neighborhood is home to a variety of Town homes, Vacation homes and of course, long term homes. The Town Homes each have their own separate porches with a small pool or hot tub inside. A pool is the perfect solution for cooling off on the hot summer days. The beautiful homes inside this great community come in all shapes and sizes, allowing you to choose the one that suits you. The Mediterranean architectural vision that the neighborhood showcases combined with a Florida accent makes these homes look like a thing of luxury. 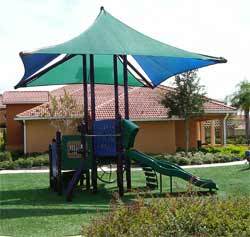 This prestigious development has all the amenities you need and more in the Central Florida area!